Fishing with 11 of the Bombay Guys at Enebærodde for a couple of days. The majority brought pontoon boats but several were wadefishing. We are here seven km from public roads but this is a spectacular place so we saw quite a lot of fishermen that had biked all the way out to the old light house where we stay. The first afternoon I went for the outer coast and that was a good choice. 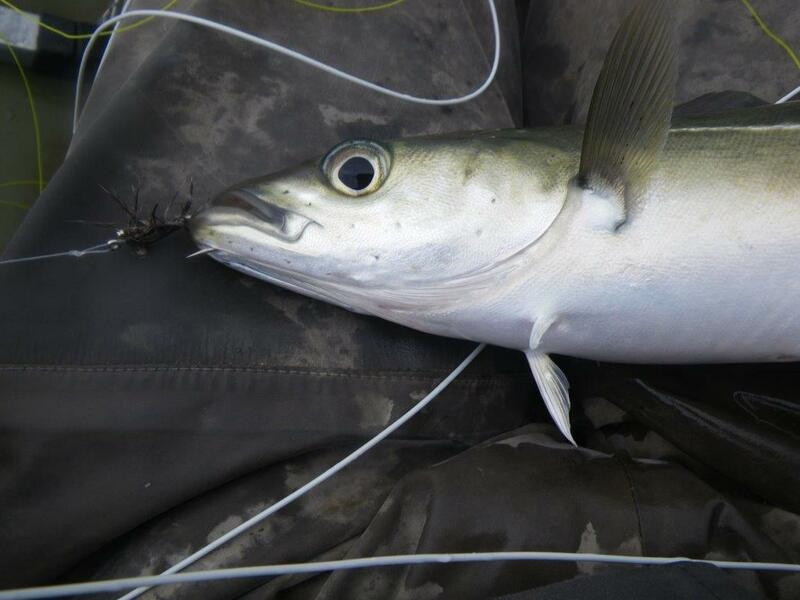 I started out with this – probably the smallest trout I have ever caught in saltwater. 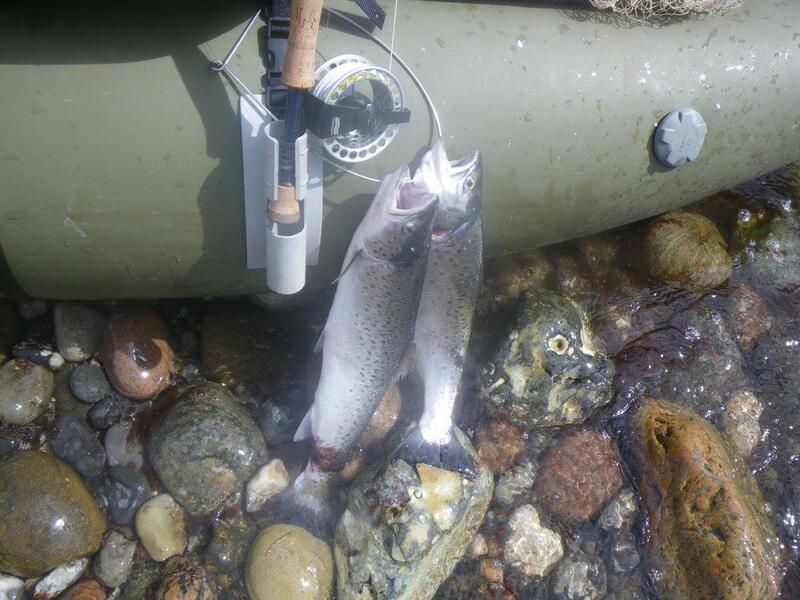 Later this afternoon I got six trout above the legal size. It was not big fish but nice fish with a couple at the 45 cm marks as the best. 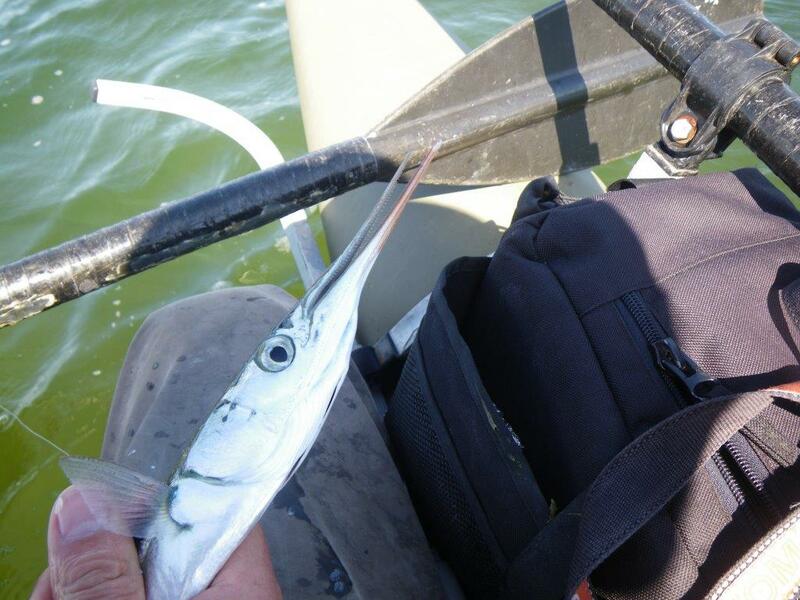 This time of the year it is hard not to get any garfish and I also got a couple. The next day the Wind picked up and we all had to fish on the inside of the peninsula. Here e small break with a lineup of pontoon boats. In the evening the Wind speed lowered and I went back to the outer coast and after the sun set the fishing started to improve. 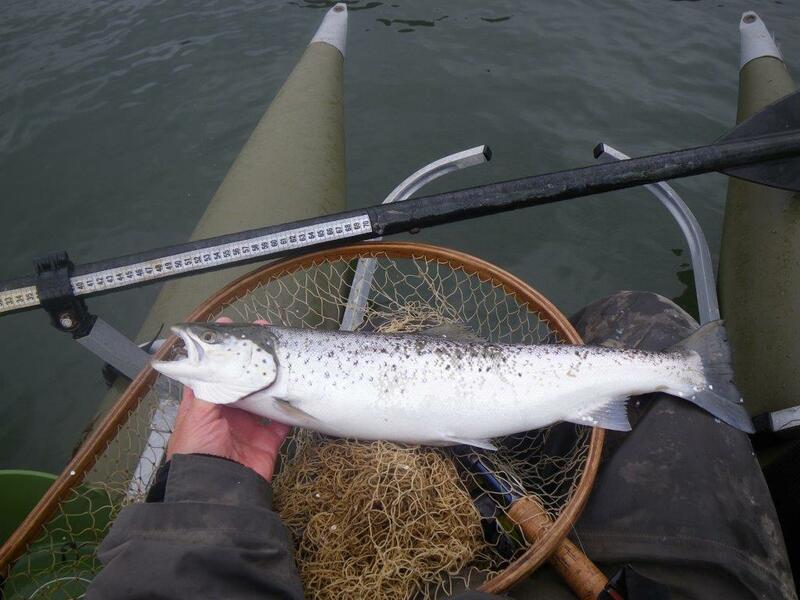 I got this 53 cm trout but the photos were very shaky so they did not do justice for this very nice fish. 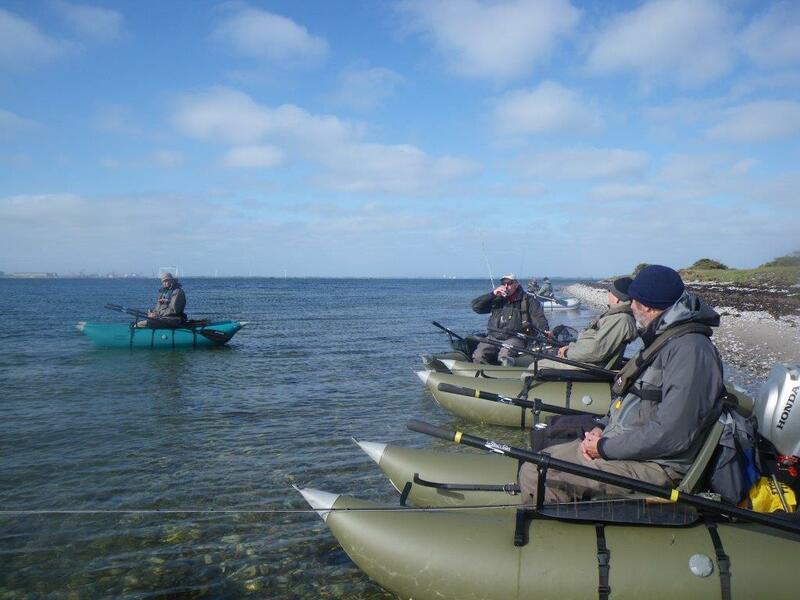 I think that we as a group got around 25 trouts above the legal size and 3 above 50 cm so not terrific fishing but OK and then we had a lot of laughs and beer so a very enjoyable trip to a beautiful spot. 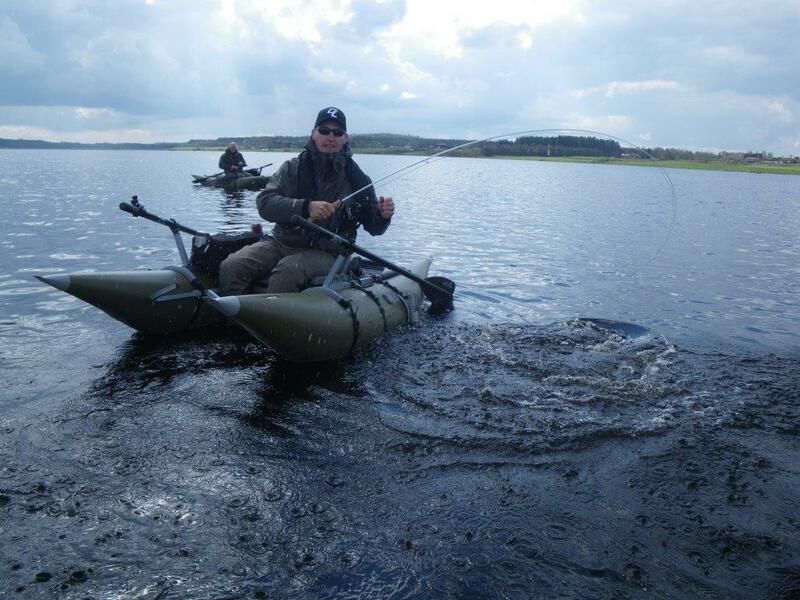 A trip with the Bombayfly guys to Djursland. I started out earlier than the rest and I wanted to fish from the pontoon boat as the Wind would come from North West and I had to cast with my left arm. 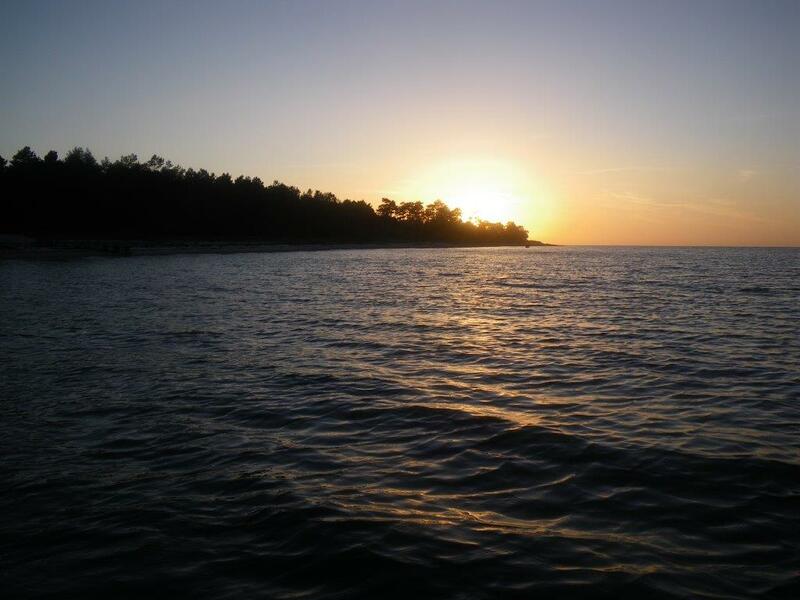 I started early and soon I saw garfish at the surface. Later I had a pollack that jumped out of the water when I lifted the fly out of the Water. I did take the fly immediately after. It was small but good fun. After the pollack I pulled a muscle in my left shoulder so I thought that I would stop but I tried with my bad right arm and if I casted without ambitions it was OK, actually better than expected so maybe I can come back to my normal casting arm Again. 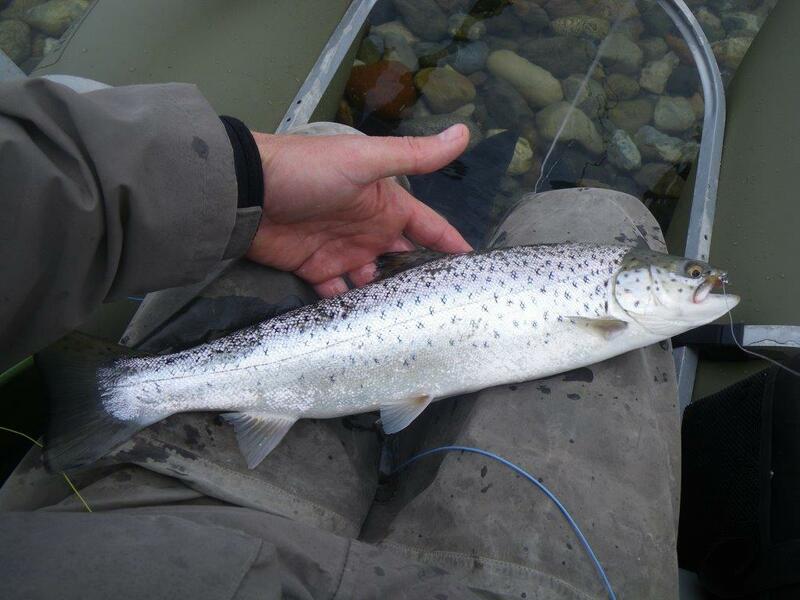 I also got this nice searun Brown trout (52-53 cm) that showed off with many nice jumps. It really nailed that fly – a sort of tan shrimp pattern. an afternoon trip in the pontoon boat alone. This time I met Thomas so not completely alone. It was much more windy than anticipated so I had work hard with the fins. 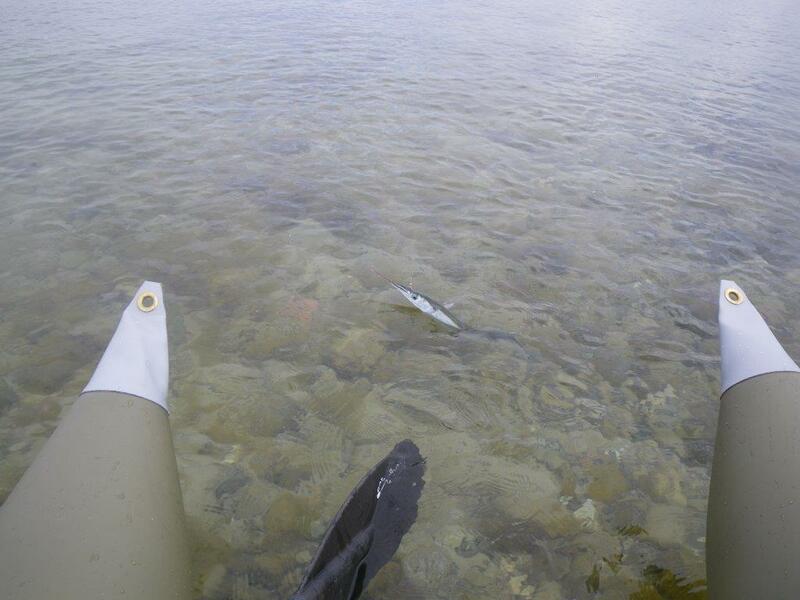 A long time went before I had any contact though I did see garfish at the surface but it was a quiet day at the office. 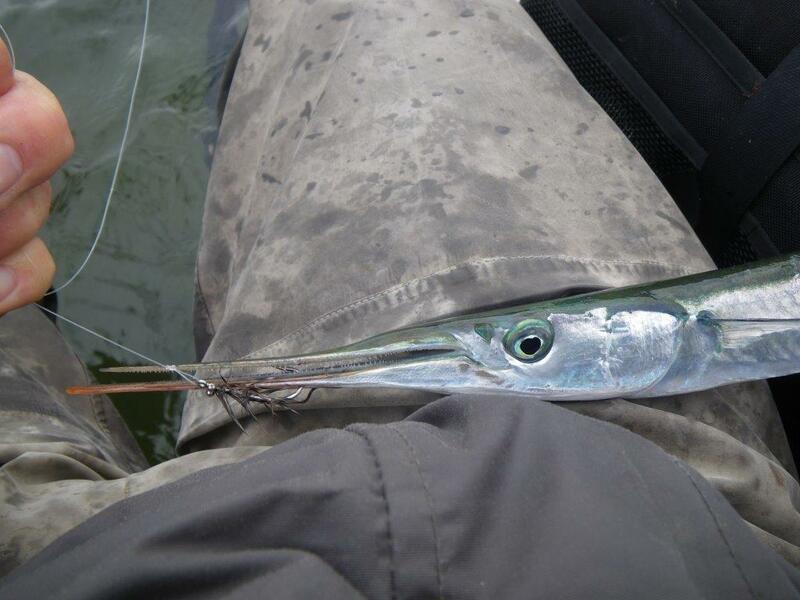 One of the garfish of the day. I got four garfish and three trouts. 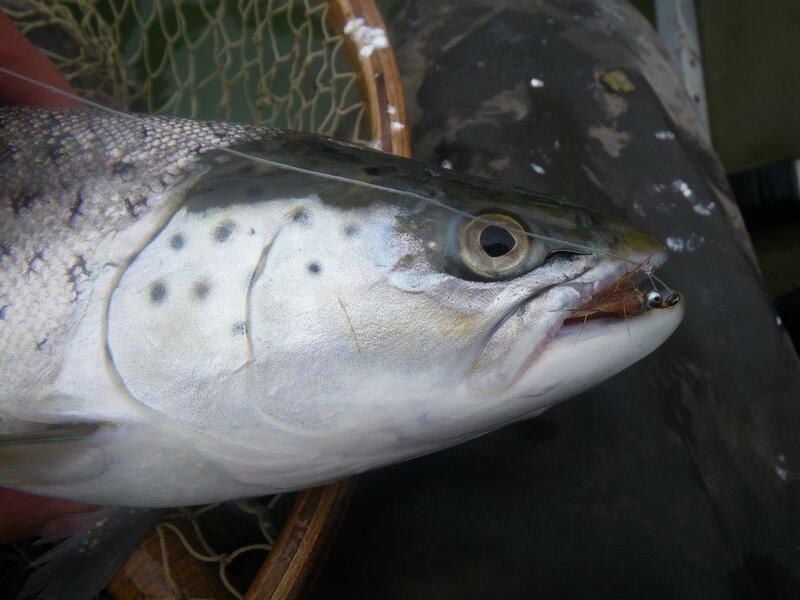 I released all the fish as the trouts were just the legal size. 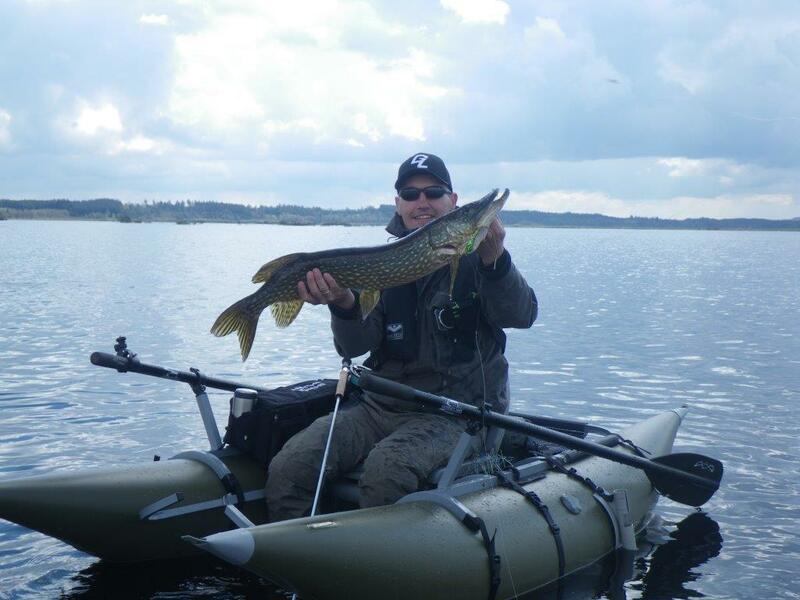 The opening day of the new pike season was spent on Bølling Sø in the pontoon boat. 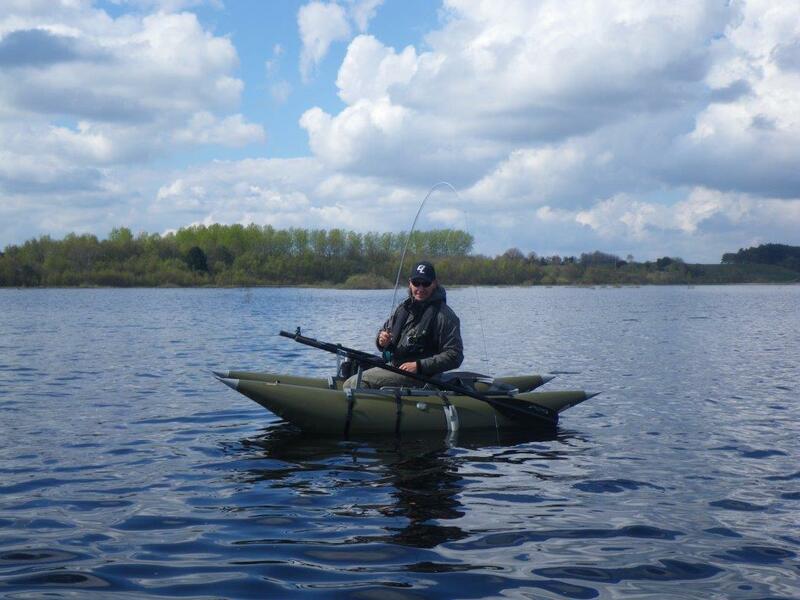 I was alone but did not lack Company as first met Henrik and Kasper and later Klaus and Steen whom I all have fished with before. Soon after I started I got three pikes but all small ones and then I had a long period without any action at all. Then I met Steen and Klaus and got another one and the we met just to chat about the fishing. While we chatted Klaus had his flash fly in the Water Next to his pontoon and after five minutes his rod suddenly bended. A pike had taken the fly while it was motionless in the Water. and finally Klaus can present a nice app. 8 lb. pike that was the biggest pike of the day. I got ten pikes and a perch. 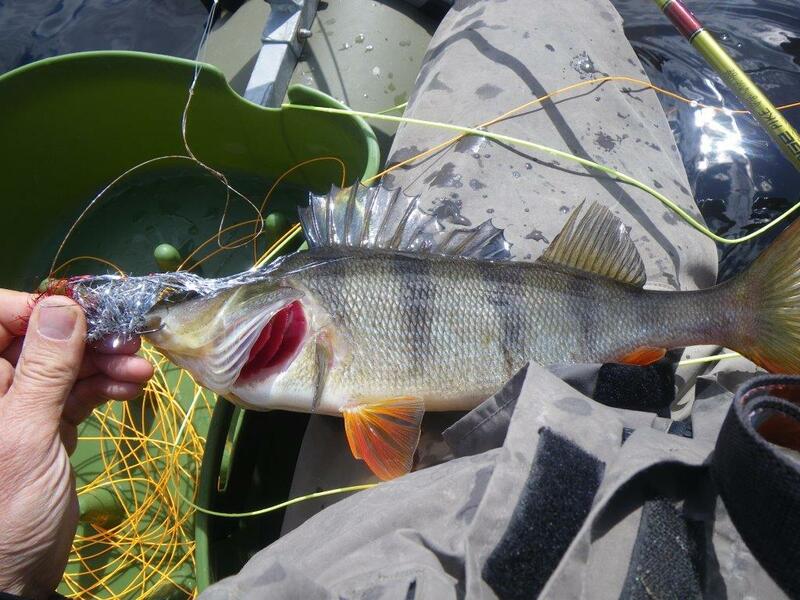 A 13 inch perch that grabbed my 8 inch flash fly. All the pikes and the perch were released and the only bigger fish I had today got tangled in som branches from a tree which there are a lot of in this lake.